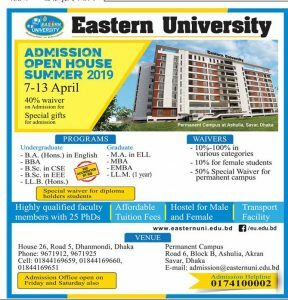 Eastern University is widely known for its quality education, superior faculty composition, excellent academic environment, sincere care for students, extensive co and extracurricular activities, successful internship and job placement, modern digital library, good governance and administration and convenient location of the campus. A group of educational philanthropists comprising academics, industrialists, engineers and retired civil servants established Eastern University in 2003. More than 9,140 students have graduated from the university by 2018. 1. Minimum GPA of 2.5 each in SSC and HSC or equivalent public examinations. 2. Candidates with a GPA of 2.00 in any examination must have a minimum GPA of 6.00 combined. 3. In case of the ward of Freedom Fighter, at least GPA 5.00 combined in SSC/Dakhil, HSC/Alim or Equivalent Examination is required. Proof of Certificate must be submitted in this connection. 4. ‘0’ Level in 5 (five) subjects and ‘A’ Level in 2 (two) major subjects with minimum ‘B’ Grade in four subjects and ‘C’ Grade in three subjects. 5. For EEE/CSE programs, students must have had Physics and Mathematics in HSC/A-Level or equivalent level with fulfilling the above criteria. 6. An acceptable score in EU Admission Test. 7. Admission Test is not required for GPA 5.00 holders in H.S.C/equivalent level of exams for getting admission to an undergraduate program. 1. The candidates applying for Master programs must have a minimum GPA of 2.00 or equivalent results at the Bachelor level and must fulfil the admission requirement for Bachelor program as per UGC’s set criteria. 3. A relevant Bachelor Degree with at least second divisions/classes in all previous exams. 4. At least 2 years of job experience with Bachelor degree or 4-year Bachelor (Honors) degree required for EMBA.